Livia Firth and Stella McCartney. Livia Firth (yes, that would be actor Colin Firth’s wife) is the woman behind The Green Carpet Challenge, an initiative that encourages designers to produce eco-friendly looks for the red carpet. Among others, Stella McCartney has hopped onto this admirable bandwagon and recently designed 13 evening wear pieces all using recycled materials from previous collections. Such waste but I tip my hat to Ms. Firth and Ms. McCartney and all the other designers involved with The Green Carpet Challenge. Women choose expensive clothes for three reasons: to feel confident within themselves, to compete with other women, to attract a man. – Ginette Spanier, ad-hoc fashion house director and fictional character in the BBC radio play, A Bullet at Balmain’s by Marcy Kahan. Ms. Kahan has written several mystery radio plays set in post WWII Europe and America and featuring the British actor/playwright Noel Coward. I often take a brand-new suit or hat and throw it up against the wall a few times to get that stiff, square newness out of it. In college I worked for a dancewear store and was taught how to fit both the ballet slipper and the toe shoe. (They don’t fit like regular shoes, but that’s another story.) I often thought, why should these cute slippers be just for ballet? One day I bought a pair for myself in mauve (they only came in black and mauve) and wore them around the house. Since then the “ballet flat” silhouette has become a wardrobe staple for women and Linge Shoes is taking a step forward into the real thing. They have come out with a line of what they call shoes that are indeed actual ballet slippers. around the house with silk pajamas – what elegance! Do you have a no-shoe policy in your home? Keep a basket of Linge Shoes ballet slippers for your guests. I also see these colorful slippers on the bride at her reception and what great bridesmaids gifts. Unlike the traditional ballet slipper they fit true to size, the vamp comes up a little higher and the elastic strap is already sewn on. I have to say that I don’t recommend these for street wear because they really are made just like a ballet dance slipper with the pleats at the toe and a thin suede sole, which offers no support. I’m hoping one day soon Linge Shoes will put a sole on that slipper and make it a shoe! We were making everything in-store, responding to what was popular and making our own fabrics. 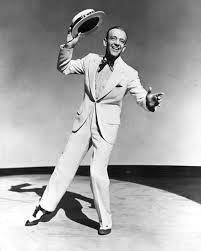 We must have made three million garments over lots and lots of designs. You know what’s selling so you can make more, or make ones from a similar pattern. It was like fast fashion but faster. – Barbara Hulanicki recently speaking to The Guardian about her very popular London shop, BIBA. 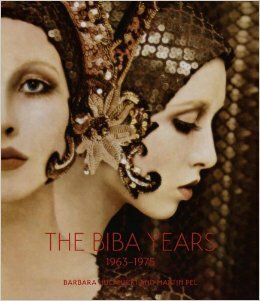 Ms. Hulanicki has just published a new book, The BIBA Years: 1963-1975 (V&A Publishing, 2014). I think expressing yourself through clothes is about knowing yourself and your own personal style and knowing what kinds of silhouettes, colors, or prints that you like to wear. 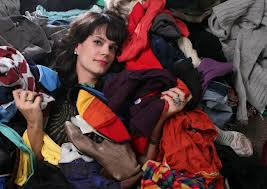 Knowing that means you naturally stop buying things that only get worn once or sit in the back of your closet. Instead, you buy things that you wear all the time and return to season after season. It’s far less wasteful and disposable. – Elizabeth Cline, author of Over-Dressed: The Shockingly High Cost of Cheap Fashion (Portfolio Hardcover, 2012). Miss Lemon was always as chic as her famous detective employer. I am very interested in fashion and was very clear about how I wanted her to appear: Very tailored. No embellishment, no frills to speak of and strong colour. Which is why we tended towards burgundy and navy and that family of colour, to be very strong and striking. Celadon green was one of my favourites, too. 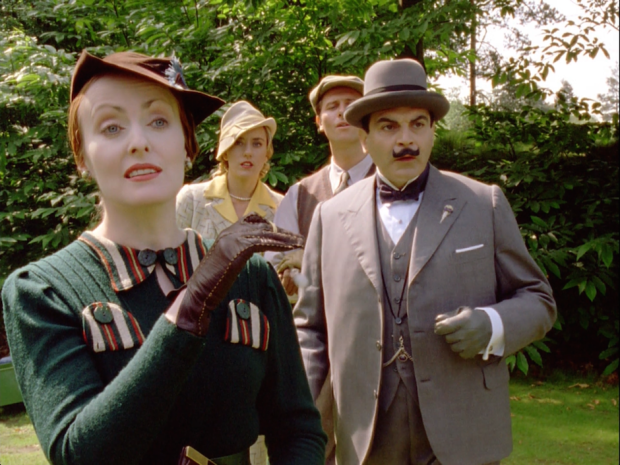 In this quote Ms. Moran is speaking of costumes for her role as Miss Lemon in Agatha Christie’s Poirot television series. In the books Miss Lemon is described as dowdy and unattractive. Well damn, Agatha, that’s no fun! Lucky for us Ms. Moran would have none of that and insisted on adding a bit of panache to her character.